The anti-smokers may have hit a new low. Joseph Banzhaf, head of the militant anti-smoking group Action on Smoking and Health (ASH), is politicizing Santa Claus to push his militant anti-tobacco agenda. Banzhaf claims in a press release that St. Nick was quitting his beloved pipe, even though a clay pipe has been associated with Santa Claus for as long as there has been a Santa Clause. 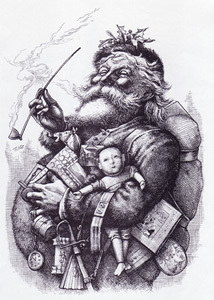 In fact, the St. Nicholas Center traces Santa’s pipe smoking back to a book written by Washington Irving in 1809. As I walked the snow-filled but unplowed streets of New York City after Christmas with a cigar in hand, I got a disappointing (if not unexpected) response from one of my fellow snowed-in New Yorkers. My fellow pedestrian felt the need to comment on how she “couldn’t stand the smell” of my Tatuaje. I thought about explaining to her how if she felt that way she should oppose Mayor Bloomberg’s smoking ban which forced me to take my smoking outside, or retorting that I couldn’t stand the sound of her shrill complaining. Ultimately, though, I just laughed and crossed the street when I was able to find a crosswalk that wasn’t blocked by a mountain of snow. Yesterday I attended the Giants-Redskins game at FedEx Field outside Washington, DC. People complain about the gameday experience there, but one plus is the Montecristo Lounge, where you can fire up a cigar in the stadium. It amazes me that so few other stadiums have embraced cigar lounges. During this particular game, the lounge was full of ticket-holders drinking $8 beers and buying up cigars. How is this not a win-win for sports teams and their tobacco-enjoying fans? I started smoking cigars about 3 years ago and I have received some very harsh comments from strangers (men and women) during this time. I'm always very surprised as they do not seem to care about cigarette smoke at the time they are commenting and giving me dirty looks about the cigar. Recently at a party one guy went so far as to telling me to step outside AFTER I had already gotten permission by the home owner. Guess I have to get used to this. It is more than a little annoying, and hypocritical, agreed!